Fantastical’s ability to parse natural language input and create detailed appointment entries on your calendar has always been the primary reason to use it instead of or in addition to Apple’s own Calendar app on the Mac. Apple Calendar has picked up some language parsing smarts in recent updates, too, but it still doesn’t match Fantastical’s control and real-time appointment preview. Still, I say in addition to because Fantastical for Mac has lived in the menu bar next to your clock, WiFi status, and other utilities where you can quickly access it for reference or adding an appointment from anywhere in the OS. The menu bar app includes a compact month view calendar above a streamlined, scrollable list view of appointments and reminders, but sometimes it’s nice to stretch out and view your schedule in a different context. What Fantastical 2 for Mac actually became is even better: the same menu bar calendar users know and love (but new and improved! ), and a full-sized calendar app with an optional dock icon. Both have been designed with the aesthetics of OS X Yosemite in mind and loads of under-the-hood features and improvements including the ability to actually change which calendars you see based on your location. Fantastical is now a full calendar replacement for your Mac. I’ve been using the new version of Fantastical for the last month or so, and even though it’s exactly the calendar I wanted since the iPad version launched, taking Apple Calendar off my dock and only using Fantastical 2 was still a process for me. That’s the scope of ambition for Fantastical 2: completely replacing the calendar app that comes with your Mac and not looking back. It’s admittedly a nervous experience, however, as you don’t want to risk missing information like important appointments and birthdays and reminders. As a menu bar app, Fantastical complimented the existing calendar experience on the Mac, but replacing your calendar entirely is a tall order. Fantastical 2 is now not only the lone calendar in my dock, it’s set as my default calendar. I’ve had plenty of time to decide if this would be solely for review purposes or not. The funny thing now is that the idea of switching back to using Apple Calendar as the full app really creates anxiety about missing information. It’s the same story as Fantastical for iPhone and iPad: it’s just simply easier to create and manage appointments and reminders in your calendar, and the information and presented in a streamlined view that doesn’t require hunting for information. Where Fantastical 1 started this experience in the menu bar, Fantastical 2 as a full calendar app excels leaps and bounds. But what about the menu bar app? Fantastical 2 has a visually overhauled menu bar app. If all you wanted from a new version of Fantastical was a new look and feel in the menu bar, you won’t be disappointed by the 2.0 release. Fantastical 2 in the menu bar no longer lives in the OS X Yosemite and earlier design world. The heavy layer of UI that held the paper calendar with staples and stacked pages maintains the same visual theme of a red calendar above a dark themed list view of appointments and reminders. The theme will be familiar to users of the latest iPhone and iPad version, and the new menu bar design fits right in with OS X Yosemite and looks vibrant and crystal clear on a Retina display. Fantastical 2’s approach to anchoring the menu bar app is super sleek. Anchoring allows you to keep the menu bar app active so you can reference it while using other apps. Previously the only way to anchor Fantastical was by clicking an anchor icon. It worked well enough. Fantastical 2 allows the mini-calendar to actually detach right from the menu bar. You can resize it, move it around your screen, do everything in the calendar you otherwise would, and even reattach it instantly by dragging it back to the right spot. This is an example of the level of polish found in Fantastical 2. I haven’t seen this specific behavior in other menu bar apps, and I’d love to see it spread (the details panel in Messages features a similar detaching method, but reattaching means closing the tear-off panel and reopening it). Fantastical 2 is very customizable, and it’s not just themes. Similar to Fantastical 2 for iPhone and iPad, you can toggle between a dark theme (default) and a light theme for the list view. This sets the list view background as either black or white on both the full calendar window and the mini window, but doesn’t change the white month view. Changing the theme on one does change the theme on the other, however, so you’ll have to settle on the same theme for both the menu bar calendar and full calendar. The dark theme is my preference on the Mac as it does a good job of creating a distinction between parts of the calendar, but the light theme may be more readable in brighter environments and still distinguishes well between the list view and month view. The menu bar icon itself can separately be toggled between black and translucent or colored. If you prefer to only use the menu bar calendar like previous versions of Fantastical for Mac, you can elect to actually hide the dock icon. This is a nice option if you decide you want to enjoy the updated menu bar app and features, but not commit to switching from Apple Calendar entirely. I started testing Fantastical 2 with this arrangement. You can still access the full calendar, but you lose the menu bar controls you otherwise see when using a full Mac app. A keyboard shortcut, Command+0, will even open the full calendar from the mini-calendar. I found myself doing just that enough times that I realized Fantastical 2 just makes sense in the dock. Having two calendars both presenting the current date in the dock is overly redundant for me; this certainly helped me decide to take the leap and solely use Fantastical over Apple Calendar. Fantastical’s icon doesn’t follow Apple’s tilted app icon approach, instead resembling more closely the shape of the System Preferences icon. In a dock filled with apps, icons can shrink to a very small size; the level icon approach exceeds in this situation as its slightly more legible than the almost-diamond shaped alternative. If you just want to use the full calendar version of Fantastical, you can opt to hide the menu bar icon as well, although I recommend both for the full experience; the menu bar serves as a universally accessible quick data entry point, although you can obviously use the full calendar for the same functionality. Fantastical 2 features calendar sets and location-based activation. We’ve long been able to create different calendars within the same system, but toggling between these calendars has been a bit of a chore. Whether you use iCloud or Google or another calendar system, you may have a different calendar for home and work to distinguish between appointment types. Fantastical 2 allows you to create calendar sets, which lets you calendar configuration groups rather than manually switching multiple calendars off and on based on your context. Speaking of context, Fantastical 2 can optionally use the Mac’s ability to reference your location. This lets Fantastical activate specific calendar sets based on where you are so you can view work-specific calendar sets when you leave home or arrive at your work address, and view your home calendar sets when you leave work or arrive at home. Because Fantastical 2 also reads your lists from iCloud Reminders, calendar sets and location-based activations also extends to toggling between specific reminder lists. Fantastical 2 includes a whole lot more including a Today Widget, share extension, and Handoff support. Fantastical 2 is now a full calendar replacement, so the full calendar window supports full-screen mode which looks terrific and feels very fluid to navigate. 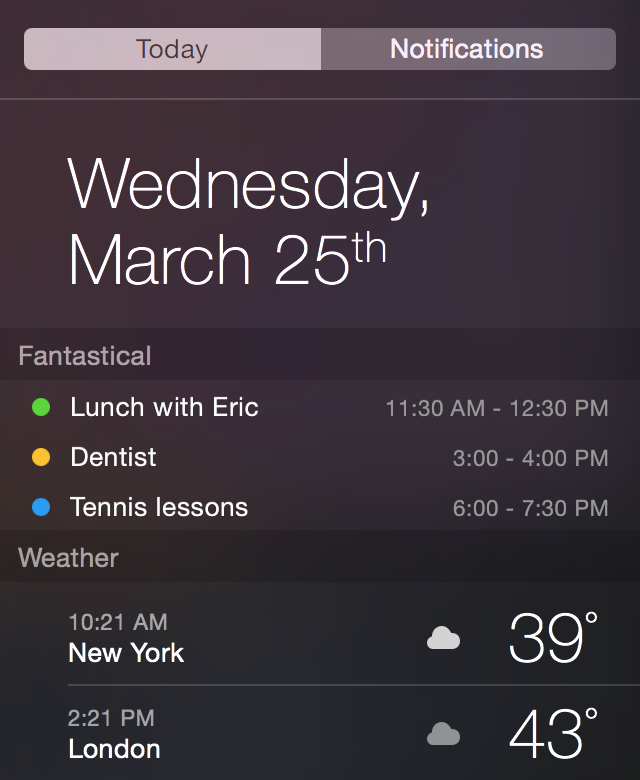 Because Fantastical 2 is an OS X Yosemite-specific calendar, the new version includes a Today view widget in Notification Center which bundles both calendar appointments and iCloud Reminders into a smaller widget than Apple’s own Calendar and Reminders widgets. Other Yosemite specific features include Handoff support for between Fantastical 2 for iPhone, iPad, and other Macs. Fantastical 2 adds a system-wide share extension that lets you create appointments with elements from various apps like URLs in Safari, addresses in Maps, and text in Notes. Fantastical 2 works with your existing calendar system using the apps native CalDAV engine so the app works with iCloud, Google, and Yahoo calendars. Fantastical 2 is localized in languages aside from English including French, German, Italian, and Spanish. Fantastical 2 notably adds full localization including language parsing for Japanese as well. Fantastical 2 is a brand new app. Fantastical 2 not only adds new features and design to the popular menu bar app, but for the first time Fantastical can completely replace Apple’s less functional calendar app. The previous version of Fantastical pre-dates 2012 with 3+ years of free updates. Fantastical 2 includes a full calendar app for the first time and is a new app for all customers. Fantastical 2 for Mac is available from Flexibits and the Mac App Store for $39.99 for a limited launch sale (reg. $49.99). I very much recommend the excellent Fantastical 2 if a polished and highly functional calendar for your Mac is at all important to you.